I did not intend to write a blog post on all of the 52 Moves in Nia. My intent was to post a few and entice you into buying The Nia Technique Book. It seems as if I just might get to all of Nia’s 52 Moves on my blog. It so happens that sometimes I am at a loss as to what to post, so I turn to a move on the list of 52 Moves. Or sometimes I am intrigued by one the moves because it is in a routine that I am currently dancing with my students. Or I am intrigued by of the moves that it is in a Nia Routine that I danced with another Nia teacher. OR I am intrigued by of the moves even though it is NOT in a Nia Routine – as in, it is not part of the original choreography, but we do it anyway. That is the fun thing about Nia Routines and the 52 Moves. You can kind of put them in anywhere. And, I will say it again, because I think it is important to state that the moves that Nia includes on their list are not unique to Nia. Nia is not claiming to have created them. Also, it is nice to know that you will experience moves in Nia that you have experienced before. The moves are on the lists and included in Nia Routines because there are benefits to doing them. Some of them are so simple the benefits could be overlooked. Some of them might seem odd to have included on a list of moves done in a dance exercise class. But they have benefits. One move that is simple and might seem random to have in an exercise class is Finger Flicks. Yeah, you read that right, Finger Flicks. Flicking your fingers. This move can be done so many different ways. Fast, slow, high, low, fingers up, fingers down, with an emotion, without an emotion, with the music, against the music, so many possibilities. The benefits of this move include conditioning the muscles of the forearms and hands. If you really use your thumb to resist the fingers the move contracts the forearm muscles and makes your fingers work! The Nia Technique Book states that this move helps rid the hands of tension. The how-to is simple enough. I bet you know it already. You form a loose fist with your hand, keeping the thumb on the outside of the fingers. Then push with all four fingers against the thumb. Allow your thumb to resist. Then let your fingers push through. Practice this move with your hand at different levels-as in high above your shoulders, at the same level as your shoulder, below your shoulders. Let your arms hang, hold them out . . . in other words flick your fingers all over. Use one hand, then the other, then both. Just flick, flick, flick, flick. Try doing it how I mentioned, fast, slow, high, low, fingers up, fingers down, with an emotion, without an emotion, with the music, against the music, play with the possibilities. You can practice this move while dancing around your home. You probably do this move without even thinking about it after washing your hands. You could probably check the mirrors above the sink to verify it. Are you familiar with finger flicks? Here is where it is obvious that the moves we include in the 52 Moves of Nia are not unique to Nia. Kicks are part of many dances, martial arts, and movement forms. Kicks can be done in many different ways. They are great for many things. In Nia while we dance we often do kicks. We count each kick as a separate move so the Front Kick, the Side Kick, and the Back Kick are three of the 52 Moves of Nia moves. I know that we did kicks in country line dancing and in West Coast Swing. They kick in ballet and jazz dance. We all know they kick in all types of martial arts such as karate, jujutsu, and kickboxing. Kicks are even a part of exercise routines and sports. I know they do kicks in Jazzercize and Zumba. Each kick requires balance, and that is one of the things that kicks are good for. The act of kicking helps improve, helps challenge, and helps retain balance. One must be on one leg and/or foot in order to kick the other leg. With a Front Kick, in Nia, we balance on one whole foot, we lift the other thigh so the foot is off the ground. We keep our alignment of our three body weights. We use our arms to help maintain the balance. The leg we are standing on is firmly rooting to the earth yet the knee is not locked. Then we extend the leg of the foot that is off the ground, allowing the shin and foot to move forward, away from the body. We look where we kick. We kick at our own level. It could be that you are able to lift your thigh so it parallel to the ground or possibly your knee is higher than your hip. Remember it is your kick so it is your balance practice. The Side Kick starts as the front kick, on one leg, the we lift our thigh, but instead of sending the foot forward and away from the body we shift our hips so the one that has the leg lifted it higher than the other one and our knee crosses the midline of the body, the we push our foot out to the side of the body. The same side as the foot that is lifted. The Back Kick has the same start as the front kick and side kick. Stand on one leg and lift the other thigh up. As with the front kick your body is in alignment. The we push the leg that is lifted, back, as if we are stepping on the wall behind us. For an additional challenge to balance you can look behind you. Just like all the 52 Moves in Nia, while doing these kicks in our Nia routines we often modify them a bit. Sometimes the kicks are slow and powerful. Sometimes they are fast and done with a bit of ease. Sometimes the choreography allows for the foot to rest on the earth before rising again to kick, sometimes not. Sometimes the kicks are done in a fast repetitive fashion. Sometimes they are meant to be done low, sometimes they are meant to be done high. But all kicks are meant to be done in your own body’s way. In addition to balance, kicks help with strength. Both legs, the standing and the kick leg get the benefit of that. Also kicking is good for exercising your coordination, especially when there is travel involved and/or arm movements. 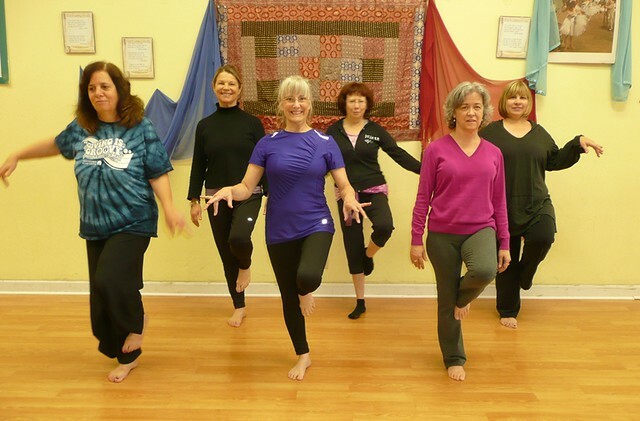 Kicks are a great addition to many dance modalities and exercise forms. I would bet you are familiar with kicks. Do you do kicks in your cardio dance class? Do you include kicks in your workout routine? In Nia we have a base of 52 Moves. Not surprising they are called The 52 Moves of Nia. As I have stated before they are not unique to Nia. You have probably done some of them at one point in your life. If you have taken dance or you participate in a group exercise class that is dance oriented then you more than likely have done some of them. They are just gathered into a group for Nia because of their benefits and fun. So they are included in the Nia Routines. Not all of them are in every routine, but a good portion appear in each routine. Plus whenever there is Free Dance they might make an appearance. One of the base moves . . . . moves we do primarily with the base of our body . . . is Lateral Traveling. Lateral Traveling is specific and different from Traveling In Directions. Traveling in Directions is a move done in all directions . . . . Lateral Traveling is done to the side. The Nia Technique (have you gotten your copy yet? Click here to go to Amazon to order your copy.) describes Lateral Travel as a step together step or a grapevine. The specifics are to start in a closed stance, then take one step to the side, then place your feet together (moving the other leg to the first leg that stepped), then take one step to the side, then move the leg toward the other one, but instead of placing it next to your leg cross it back. A grapevine is where you step one leg to the side then the next step is BEHIND, then step to the side, where the next step goes depends. Sometimes you can land on the heel or behind or with the knee up. Grapevines are a nice replacement for four point turns. There are many reasons why people don’t turn so using this lateral move, the grapevine, is perfect. With both methods the instructions say to use your hands to lead you. Have them out in the direction you are going. The instructions also say, “When you step behind, step onto the back ball of the foot and keep your knees spring loaded and your spine vertical.” For clarification, the “back ball of the foot” is the foot that is in the back or behind. So this is the specific Lateral Travel: Step together step or grapevine. I have found my self using the phrase “travel laterally” at times when I am leading my San Jose Nia class (or any Nia class for that matter) and I am not instructing them to do the specific Lateral Travel. But I guess that is the difference. There is “travel laterally” and do the “Lateral Travel” move. Many moves in Nia are good for the coordination. This is one. Step together step is not necessarily a difficult move but depending on the speed and what comes before it and after it, it can call upon your coordination. Although, I would say this is one of the easier 52 Moves of Nia. Varying the speed and adding some movement to the body can change it up a bit and perhaps add a some challenge to it. So there you have it another move in Nia’s 52 Moves. You probably find yourself doing this one often, huh? Even when you are not on the dance floor? There are six stances in the 52 Moves of Nia. Closed Stance, Open Stance, “A” Stance, Riding (Sumo) Stance, Bow Stance, and the Cat Stance. Each stance has a sound associated with it for practice. There are benefits to doing each stance. All of them help with balance. With the cat stance the balance is on one foot. The cat stance is a stance in which you stand on one leg, using your whole foot. The leg you are standing on is not rigid, but the knee is soft, as if you were going to pounce. The spine is upright, hips are level, not pointing down nor up. The foot that is off the ground is pressing with the side against the standing leg, the foot relaxed, toes hanging towards the earth. Elbows are bent, relaxed. Either both elbows are at the sides or one slightly forward. The arms and hands are engaged. The cat stance is done on alternating legs. These are the specifics of Nia’s Cat Stance. There are specific ways to do a stance, the body’s way. But your body’s way is also recognized. So different bodies will do it different ways. Some will do it their own way until the body can adjust to the specifics and some bodies will continue in their own way. For instance some bodies will use the power finger/balance finger hand technique to assist them in standing on one leg. In addition to each body having its own way to do each move sometimes the way the move is done in a routine alters the specifics. The specifics stated above are according to The Nia Technique book, however in the routine Birth, the cat stance in one of the katas consists of hooking the bent leg’s foot around the standing leg. In this particular dance, while we are in the cat stance with our foot hooked around the standing leg, our hands and arms are different from is described in the ideal cat stance stated above. One of our hands “hooks” around our face. This is often the case. There is a specific way to do each of Nia’s 52 Moves, but each individual has their own body’s way that adjust the specifics AND the specifics are sometimes adjusted according to move in the routine. But it is important to know the specifics and the basics. It is also fun to practice the specifics and the basics. The basics of the cat stance help with balancing on one leg. This can also be considered a strengthener, the standing leg’s muscles can be strengthened through the practice of supporting all of one’s weight. If this move is being done solely as a practice of the move, then agility can come into play. The practice of walking then stopping and moving quickly into cat stance would allow for the agility. Alternating with a light hop from whole-foot-cat-stance on one leg to the other is an exercise in agility. While this type of movement might also be something we do in a Nia routine it is not always the case. Sometimes we move into cat stance and from there do kicks. As with all of Nia’s 52 Moves we play with them. All of Nia’s routines consist of playing with movement and music. With the cat stance you have the specific way to do it, then just like a cat you can play as you practice. You can “meow” and use claw hands. The cat stance is a fun way to play with balance and sounding. Practice the specifics then let the animal in you out! At this point you might have noticed that I only have a post for 9 of the 52 Moves of Nia. I am going to work on that. 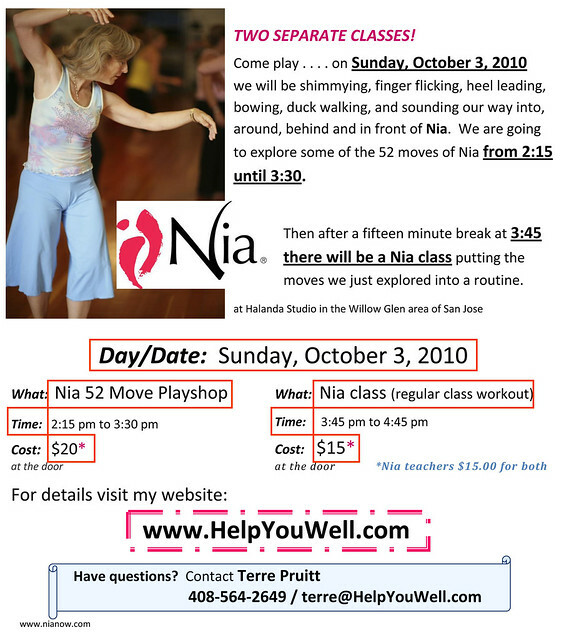 I have a Nia friend who is posting about the 52 Moves of Nia on her blog and she has inspired me to continue on. I have the list of the moves on my website. I link the blog post from there so people on my site can click to see a description and possibly a picture. With only 9 post I only have 9 links. This is ten and moving forward. Nia is a unique cardio dance exercise that combines nine movement forms into a fun and energizing workout. Nia has moves we call the 52 Moves. Many of them are common to other dances. I am posting here about Toes In, Out, and Parallel. I know I have seen these moves in other dances if not done together at least done separately. To do the move as one move you start with your feet parallel to each other. They can be hip (joint) width apart. Then turn your toes in to face each other. Turn them in as far as you comfortably can. Then swivel your feet out so the toes are pointing in opposite directions. Again, only do it as far as you can — comfortably. This is the whole move. There is a routine where we are in A Stance and I have the participants dance toes in then toes out. Which I consider a lot of fun. You can play with this move by trying to walk with toes facing in, then with toes facing out. I like to play with the move by doing one foot toes in and out. Sometimes just letting one foot do a dance all of its own; in, out, in, out, tapping my toe to the ground with each twist of my leg. I also like to do this move with varying stances. My instructions here say to start in open stance, but it can easily be done in A Stance (as I mentioned I do in my Nia class). You’ll notice that different muscles are used when you change the width of your stance. Moving the feet in this manner allows for all the bones in the leg to rotate which gets the thigh bones moving in the hip socket. Movement is a way to keep the joints health. Movement helps fluid into the joints. I say “juicy joints.” We move to have juicy joints. In addition to helping the hip joint this move helps keep the ankles mobile and the knees flexible. With healthy hip joints, ankle joints, and knee joints the enables walking and moving in general to be done with ease. So even though this is one of the moves we use in our dance exercise routines that does not mean the use of it is limited to that. You can decide to walk with toes in for a bit during your day, then with toes out. While standing you can stand with toes in, then out, then parallel. It is an easy exercise to play with and incorporate into your day. And it really does help with the health of your joints. Are you gonna do it? On your trip from your desk to the coffee pot? While you are going about your day with the kids? Which on in your favorite, in or out?